Mine has….! I am in the East Devon constituency from the date of the next General Election, when the new constituency boundaries come into effect, I’ll be in the Tiverton and Honiton constituency (although still in the East Devon local government district). The Boundary Commission is legally required, by the Parliamentary Constituencies Act 1986 (as amended by the Boundary Commissions Act 1992), to conduct a general review of all the constituencies in England every eight to twelve years to ensure the size and composition of constituencies are as fair as possible. The Commission’s recommendations throughout the review must by law be based on the numbers of electors on the electoral registers on that date. The new-look Ordnance Survey Election Maps website is a fantastic resource for for use by teachers, MPs, councillors, candidates and party workers. Users can select from a variety of administrative and electoral boundaries that can be overlaid on the mapping. 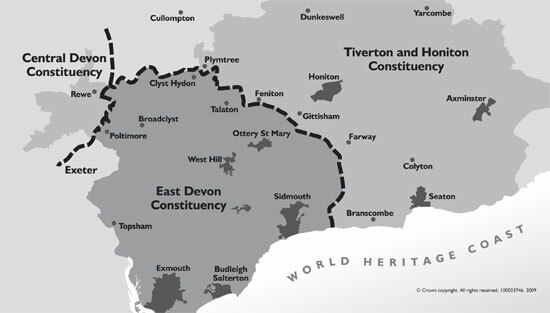 The East Devon constituency will change quite a lot – click here to see a map of the old boundaries. It currently includes Axminster, Seaton and all the small villages near me including Stockland, Membury, Dalwood, Yarcombe, Shute, Kilmington, Offwell, Dalwood and Cotleigh. All of these places will soon be in the Tiverton and Honiton constituency. The current MP for Honiton and Tiverton is the conservative Angela Browning. Hugo Swire (also Tory) represents the East Devon constituency. The new East Devon area will include Ottery St Mary, West Hill, Broadclyst, Poltimore, Talaton and Clyst Hydon. If you would like to check which area you are in – see the East Devon council website. LOOKING FOR DETAILS OF THE NEXT EAST DEVON GREEN PARTY ? LOOK OVER TO THE RIGHT – THE CATEGORIES SECTION, CLICK ON EAST DEVON GREEN PARTY OR CONTACT ME. I was looking around the East Devon District Council website this morning and found a handy way to find really useful information in your area. Click on http://www.eastdevon.gov.uk/my_neighbourhood.htm and scroll down to where it ways My Neighbourhood in green. Enter your postcode – this takes you to another page where you choose your address then click “view property details”. It then provides you with lots of useful info like your recycling and refuse collection days, your nearest sports centre, library, swimming pool and electoral details. I’ve found out my ward is the Yarty Ward (as suspected when I was writing about the East Devon Constituency in December). My parish is Membury CP and my councillor is the Conservative Paul Diviani who lives just up the road from us in Yarcombe. Paul has been an elected member since 1999. I am hoping to stand for the general election in the spring if we can get an East Devon group off the ground – PLEASE help us make this happen. Get in touch. That’s me at the bottom with one of my chickens! The Green Party is the only party that has the policies to tackle head-on the economic crisis and at the same time lay the foundations for a sustainable and fair society. Life on Earth is under immense pressure. It is human activity, more than anything else, which is threatening the well-being of the environment on which we depend. Conventional politics has failed us because its values are fundamentally flawed. The Green Party isn’t just another political party. Green politics is a new and radical kind of politics guided by core principles like building a sustainable society that guarantees our long-term future. Humankind depends on the diversity of the natural world for its existence. Green Party members do not believe that other species are expendable. Our actions should also take account of the well-being of other nations, other species, and future generations. We should not pursue our well-being to the detriment of theirs. A healthy society is based on voluntary co-operation between empowered individuals in a democratic society, free from discrimination whether based on race, colour, gender, sexual orientation, religion, social origin or any other prejudice. The Green Party believes in democratic participation and accountability by ensuring that decisions are taken at the closest practical level to those affected by them. If you need to check whether you are in the East Devon constituency which includes Axminster, Sidmouth, Seaton, Exmouth, Axmouth and Budleigh Salterton simply click here and enter your postcode.